Is this a Good Time to Buy a Home? Yes and Here’s Why . . .
Today is one of the best times to go for the American Dream of home ownership or upgrade if you need to expand to a larger place.Â Here are key points to keep in mind. 1. Low Interest Rates. Interest rates are still hovering at historic lows. This means that you can qualify for more house for your money than you may if rates shoot up.Â If you wait, you could be priced out of a home that is at the top of your comfort range if rates increase.Â No one knows how long rates will stay low. Â Â If you are on the fence about buying this is definitely a reason. 2. Mortgage Interest Deduction: Currently home mortgage is deductible on your taxes saving you money. 3. Affordability: Low interest rates along with recently falling prices in some areas have given buyers even more of a reason to buy.Â Price is the number one reason a home sells. 4. Paying Towards Ownership. Each payment you make on your own home goes towards your future equity.Â You are paying yourself instead of the Landlord. 5. Appreciation: Besides paying toward ownership you have the opportunity to get more value as the equity as your home value increases.Â So, in most cases, you will gain more value in staying in your home longer. 6. Home equity: As you build home equity, you gain value by being able to borrow against it for repairs and improvements. 7. Stability: Owning a home builds stronger communities, people take pride in their homes and neighborhoods and get involved in their community. 8. Monthly Payments: Once you have paid off your 15, 20, or 30 year mortgage, you will be free of that monthly payment.Â You will still be paying property tax, insurance and some maintenance. Â In most cases, reduction in monthly obligation will be less than what you would be paying a landlord. 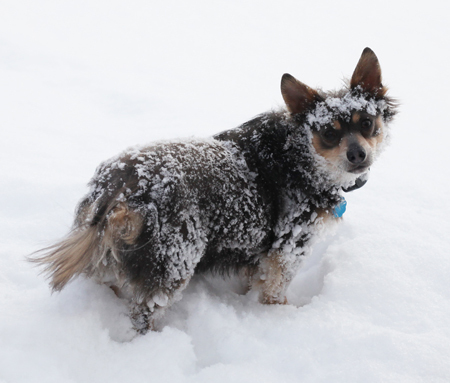 Here is aÂ photo of one of my puppies, to share from the February 2010 blizzard, since the snow season is upon is.Â We can hope we don’t get that much this year.